The New York City Photo Show features dealers who specialize in the sale of nineteenth, twentieth, and twenty-first century images such as daguerreotypes, ambrotypes, tintypes, cartes-de-visite, cabinent cards, as well as vernacular images, stereoviews, snapshots, photos by well known photographers, images by up and coming photographers and dealers of new, used and rare books on photographers and photography, and museum quality images. Its a great opportunity to view and purchase images from $1- 10,000+. Copyright © 2015 USPhotoshows, All rights reserved. "I remember when it all started, back in April of 2015," said show creator Erik Assadourian, "when we launched our very first call for contestants to find six young Americans willing to move back in with their parents to convert their parents' and other neighborhood lawns into yardfarms." Back then, more than two-thirds of American adults were overweight or obese, most ate diets full of highly processed foods made primarily from corn, wheat, and soy, and at the same time many Americans spent thousands of dollars a year sustaining polluting, climate-changing, monocropped lawns. In fact, as hard as this is to believe now, in 2015 the fifth largest crop in the United States by acreage was the turf-grass lawn. "Those certainly were barbaric times, where Americans ceded control of food production to large companies who used a mix of fossil fuels, genetic engineering, and toxic pesticides to manufacture calorie dense but nutrient poor foods," said Assadourian, "all while literally sitting on huge reserves of fallow land just begging to be farmed." But today, after 14 seasons, most former lawn space is now devoted to producing food for the household and surrounding community. 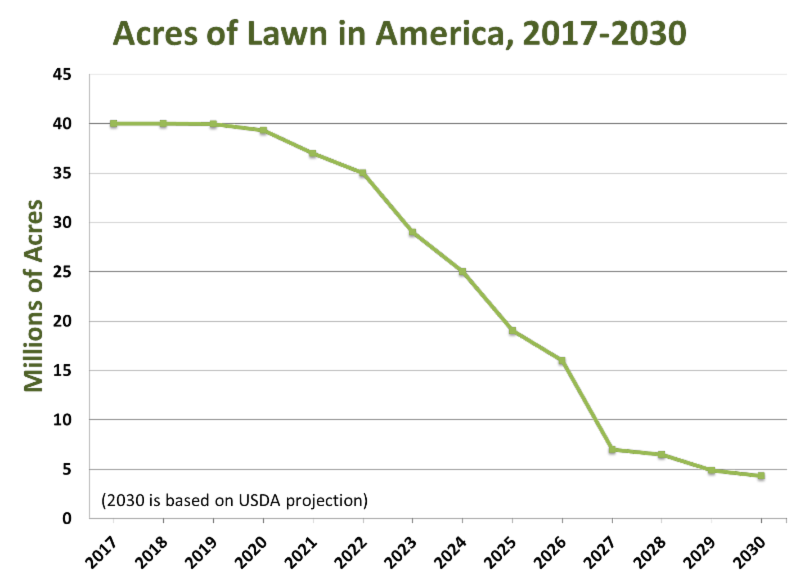 And of the 4.3 million acres of lawn that still exist--- down from roughly 40 million acres in 2015 (See Figure)--- most are in the form of community parks and athletic fields, both of which also serve as grazing land commons. This transformation of America's lawns into yardfarms ("yardfarm" officially entered the Oxford English Dictionary after Season 5 in 2021) played a significant role in increasing local food production to the current one-third of daily food needs, in bringing America's overweight/obesity rates down to the current 18 percent, and in reducing the climate emissions of the agricultural sector by nearly 40 percent. Experts also point to the show as what prevented America from being seriously affected by the global famine of 2026, when massive droughts simultaneously hit the bread baskets of the Midwest, Western Europe, and Russia. "As most American communities produced at least part of their daily food needs, they became more resilient in the face of more unpredictable climate patterns," wrote food scholar Michael Pollan in his best-selling history of the yardfarming revolution, Let Them Eat Carrots (Island Press, 2028). With the human population still growing--- now at 8.1 billion--- and greenhouse gas emissions still not stabilized, all strategies to make communities more resilient are valuable. Yet with lawns no longer being seen as a "normal" part of the urban or suburban landscape, and with multigenerational households now commonplace in the U.S., the idea of encouraging young people to move back in with their parents to create more robust household and community economies by converting lawns to yardfarms has run its course. "Yardfarmers has achieved what it set out to do," said Assadourian, "and it's time to put the show out to pasture for a well-deserved retirement." 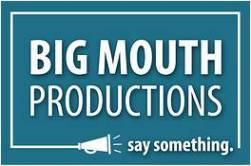 Katy Chevigny, award-winning filmmaker, co-founder of Big Mouth Productions and director of the first three seasons of the show, noted surprise upon hearing news of the show's cancellation. "Honestly, I remember being pretty skeptical back in 2014 when Erik approached me with this project. I thought reality TV was just too corrupted to be made into an agent of social change," said Chevigny. "But Yardfarmers helped put the real back in reality TV and in the process helped put America on a far more sustainable path." Of course, none of this would have happened without the success of the first season that aired in 2017. And the call for contestants that launched on April 2nd, 2015 is when it all started. At that time 36 percent of young Americans (ages 18-31) were living in their parents' homes. But back then, living with mom and dad was typically a source of shame. Yardfarmers succeeded in tapping into the changing social realities and converting that shame into the pride of living healthy, interdependent, community-connected, sustainable lifestyles. As the original call for contestants noted, "The conversion of a million acres of lawns to yardfarms begins with one seed sown." Fourteen seasons and 36 million acres later, that conversion has now run its course. in partnership with the Worldwatch Institute. More information about the show can be found at yardfarmers.us and more about the call for contestants, including official rules, at yardfarmers.us/call-for-contestants. The Chicago-area’s most popular mobile food trucks, offering an exclusive opportunity to sample in one venue cuisine favored by many local foodies, will roll into Westfield Old Orchard shopping center in Skokie this Saturday, April 4. The debut of the North Shore Food Truck Festival, sponsored by PopUp Republic and Westfield Old Orchard, will feature a variety of mobile grub hubs dishing out a wide selection of savory and sweet sustenance. The festival, held in conjunction with the center’s annual Spring Garden Party, runs from 11 a.m. to 3 p.m. in the west parking lot. “Most of these food trucks, familiar to many Loop workers, are making their first appearance in Skokie,” said Jeremy Baras, CEO of Pop-Up Republic, a Chicago-based social media marketing company focused exclusively on pop-ups. “Food trucks, a leading pop-up category, have emerged in recent years as trendy dining options and have reached such growth that they are often the featured attraction at festivals and other events. “This inaugural festival offer shoppers and epicureans the opportunity to sample gourmet food and other irresistible selections ranging from cheesesteaks and lobster rolls to dumplings and delectable desserts,” Baras added. In addition to the gourmet food, students from Niles North High School will be selling beverages at the event with all proceeds going to Relay For Life to benefit the American Cancer Society. Other North Shore Food Truck Festivals are planned to take place later this spring. The Westfield Old Orchard Spring Garden Party celebrates Easter and the start of spring with a full slate of activities for the whole family to enjoy, including face painting, balloon animals, Easter egg hunts and a petting zoo. Consumers may attend the free general event from 10 a.m. to 1 p.m. and/or a VIP rooftop party from 1 p.m. to 2 p.m., with tickets selling for $15. Old Orchard Shopping Center is located at Skokie Boulevard and Old Orchard Road. "In a land where spectacular pyramids and sophisticated ancient cities “steal” the lamplight from everything else, it is easy to bypass the early churches “hidden in plain sight” in a myriad small towns. Yet they may be among the most dramatic examples of the mutual accommodation that took place between the talented indigenous artists and those who had brought a set of very different ideas from across the ocean. They tell a fascinating story that few have heard and I have conceived this project to let the tale be told to more people. This is the first phase of a broader project that seeks to document some of the earliest churches built in Mexico. I am looking for help in financing the cost of traveling to and photographing some 12 different churches in the States of Morelos and Puebla, in order to document their architecture, setting and art."